This chocolate topsy turvy cake was made for a man who has a hush hush job. We joke that he is a spy. He turned 44 so I incorporated that on the playing cards and dice, which are hard to see in these pictures. I baked then buttercreamed the layers then carved them to create the topsy turvy effect. There were four layers in each tier so it was pretty heavy. I supported it between every two layers to keep it from smashing beneath the cake/fondant weight. This was my first attempt at doing lapels. I folded newspaper to replicate a jacket front and trimmed it to resemble lapels. I then flattened out the newspaper and using a pizza cutter, I rough cut the fondant. I folded back the lapels then with scissors did the notches. I painted the lapels with the Wilton gel paint to make them look like a tuxedo. 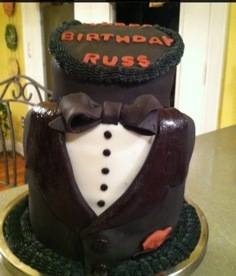 Both tiers are tuxes. The poker chips, playing cards and dice are all gumpaste. I wasn't happy with where the two tiers joined so I tinted the leftover buttercream and billowed a layer. It is still one of my favorite cakes! May I share one of your articles on my site about Find Halloween Costumes?